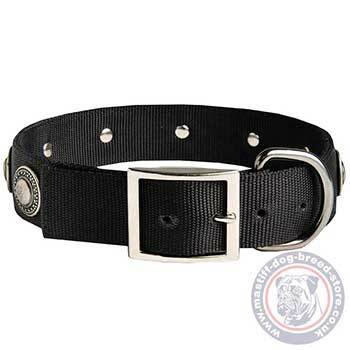 Get a nylon dog collar with medals and a buckle. Sizes: 14-40 in (35-100 cm). Color: black. Nylon dog collar with metal details is a good choice of a daily dog walking gear for a strong mastiff dog. Mastiff collar is intended to control huge dog power. That's why this nylon dog collar is 2 ply and securely stitched. Strong nylon belt is equipped with a durable buckle and D-welded ring. We wish your dogs to look gorgeous each day, even at a regular dog walking. Point out the elegance of mastiff dog breed with this simple and smart design. 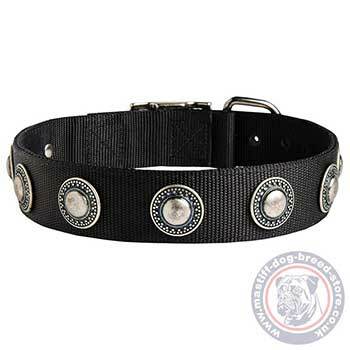 Nylon dog collar for mastiff is decorated with metal circles. The circles are made in old-silver style with engraved ornament. All the metal details are smooth, polished and rustproof. They will not disturb a dog in walkign or even active training. Nylon dog collar is light. Though it has metal decorations, it will suit for medium and large dog size. The width of nylon dog collar's strap will help you to manage mastiff temperament and power in daily situations. There are 5 holes for buckle adjustment. The distance between the holes is 1 in (2.5 cm). The collar will correspond to the neck of your dog at the central hole (C). The 2 additional holes by each side serve to regulate the size if your dog grows or loses weight. Nylon dog collar with buckle and decorated with metal medals combines quality, reliability, multipurpose functionality and reasonable price. Waterproof nylon dog collar is perfect for daily use in any weather conditions. 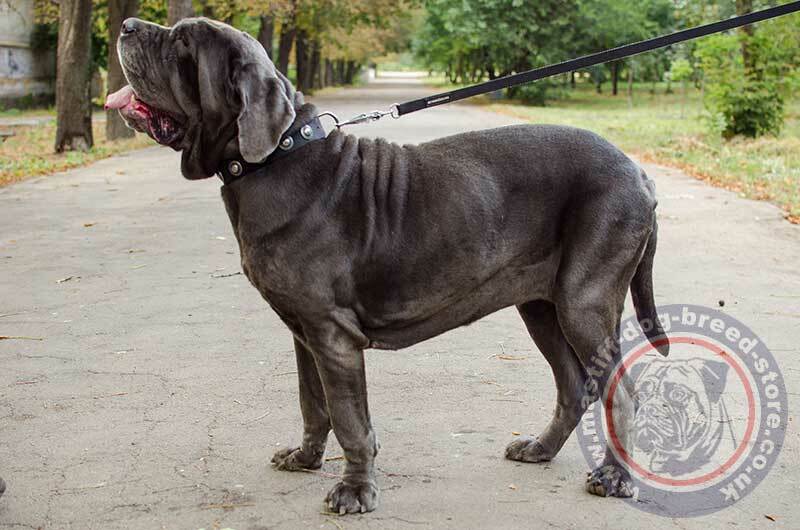 The strength of nylon and metal details guarantee reliable control over your powerful, large mastiff! Studded Dog Collar - Excellent Quality!